It is a simple Punjabi baigan bharta recipe without the use of many masalas and spices. Less or no spices help in retaining a smoky aroma and flavor of the roasted baigan . Wash the baigan (eggplant or aubergine) with water. Dry with a kitchen napkin. Apply some oil on the baigan and keep it for roasting on an open flame. Keep it turning on the fire after couple of minutes such that the baigan gets roasted on all sides completely. When soft and well roasted from all sides, remove from fire & soak in cold water for removing the skin. Peel the skin of the roasted baigan. Keep it on the chopping board. Cut the stem of the baigan. 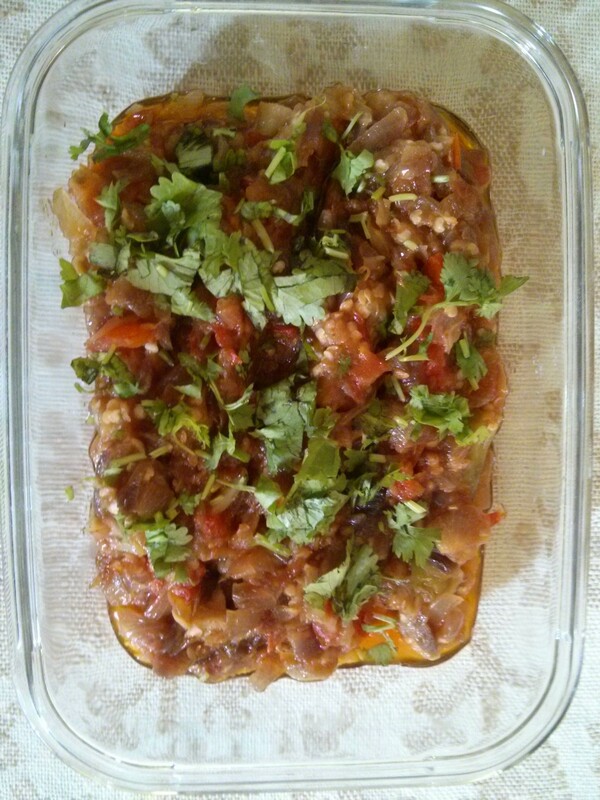 Mash the roasted brinjals with a fork. keep aside. When the baigan is getting roasted, finely chop the onions and tomatoes and keep aside in two separate bowls. In a kadai/ wok or heavy bottom pan heat up the oil. Add the onions, fry the onions till golden. Add the ginger, garlic and sauté for few minutes. Add the mashed brinjal, tomatoes cover and cook for some more time till tomatoes are cooked and well blended with mashed brinjal, onions. Add, salt, chili powder and mix well. Take out the bhrtha in a serving bowl. Just before serving garnish with fresh coriander. Serve hot with tandoori roti, chapatti, paratha, etc. Variation: One cup of lightly salted boiled shelled peas can also be used for garnishing along with chopped coriander leaves.